Yes, I initially replied to their email and await a response. 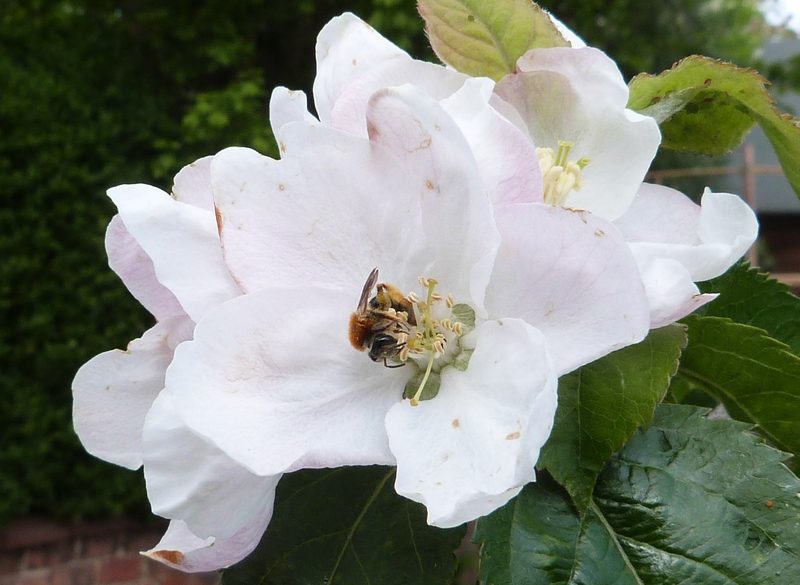 Are Honeybees actually “in decline” in UK? What are the latest stats saying about beekeeping trends? The latest stats that I’ve seen suggests that numbers of hives are going up, but are still low compared to, say, the 1950s. That’s an excellent question. Strangely, on the conference brochure there is a gigantic entry listing all the people/parties who should, in the eyes of the organisers, attend the event, but absolutely no information on who will be enlightening the masses. We (Natural Beekeeping Trust) will join you in giving it a miss. Regarding your statement about the relative importance of different classes of pollinators, we cannot but disagree. The honeybees’ unique feature and value as pollinator is intrinsically connected with its overwintering and availability in large numbers very early in the season. Whether honeybees need the management beekeeping orthodoxy asserts to be vital is another matter. Good point, yes, there is no indication of who will be speaking. If you follow the Breeze et al. link you’ll see that the latest research shows that, collectively, the “other” pollinators are more important than honey bees. Yes, honey bees are particularly important early in the season for crops such as apples, but so are a range of early emerging solitary bees such as the Andrena species illustrated in my photograph. In a six year survey of New York apple orchards (the second largest producer of apples in the US) we’ve found that wild bees are more important pollinators than honeybees at 14 of 23 orchards, and equally important at another 5 orchards. This is in spite of the fact that the orchards here rent high densities of honeybee hives. Thanks SOIMF, look forward to seeing that study published! Haha I’m working on it!! Excellent post, Jeff. I’d argue honeybee decline is even less of an issue (perhaps even something to be celebrated) in North America, where honeybees are non-native and arguably invasive. Yet we hear the same BS here about how horrible it is when they “decline”! I don’t know why disagreeing with the amount of pollination bees actually do should prevent you from participating an a good bee conference!!! It’s not the amount, it’s the fact that they are focused on the wrong species. Any conference that is going to promote bee keeping as the answer to “saving the pollinators” is looking at the wrong solutions to the wrong questions. The reason I’m not attending is that it will not be “a good bee conference” as it is not underpinned by good science! It’s the equivalent of attending a law conference run by people who know nothing about the law. Mary, do enlighten us on what grounds you call it a good bee conference. When I called them today, not a single speaker had been confirmed. Yet, the attendance fee is confirmed. It looks extremely unprofessional, quite apart from postulating an arguably non-existent problem. Thanks John, but I’d rather disseminate what knowledge I have via this blog, to a wider audience, rather than fee-paying attendees of a profit-making event. granted you will reach more people through the blog. But if one’s aim is to have one’s knowledge impact upon public policy; communicating to the right people, as opposed to the most people, may be more beneficial – at least in some instances. Even the new bee postage stamps show 6 wild bees, and 4 honeybee activities (which include pollinator) – are they implying that wild bees don’t pollinate? Interesting as have often wondered where some of these ideas and stats come from. Hardly see honey bees where I am among the wild flowers but there seem to be plenty of other flying fellows, including a range of different types of wasps. I hope to look more into this in the coming year. There are different pollinators at different times and different flowers. Not sure who pollinated my tomatoes either! There is so much misinformation flying around from both the pro-bee and pro-agrochemical lobbies, it’s very irritating and devalues much of the discussion. I have refused to sign several pro-bee petitions from pressure groups because of their extravagant and incorrect claims. It’s so important to follow the evidence. I rang the organisers today and voiced my concerns over the factually incorrect statements in their summery on the page. I have suggested how they might turn this event around into a worthwhile event to attend and given them some references to check out for accurate facts about honey bee populations. So far they have NO confirmed speakers and were not able to even hint at who they have approached to speak. Worrying doesn’t even begin to cover it. Thanks Mark. When I checked the conference page last night it appears that some of the misinformation that I quoted has been removed, so it seems as if your phone call had an effect! The one piece of logic you seem not to have considered is that if (IF) honeybees are in decline due to new insecticides, then the thousands of other native pollinators could well be at risk as well. It matters less that honeybees pollinate this or that percent – the fact that we can manage their populations gives us a window into the environment they all live in. Hi Thomas – I don’t follow your argument. How will focusing most of our attention on a minority pollinator help us to reverse declines of wild pollinators that have been happening for decades, long before the use of neonicotinoid pesticides? The main problem causing those declines in wild species is loss of habitat due to more intensive farming. Pesticides are just the latest assault, not the main cause. Habitat loss due to more intensive farming?? Or do you mean more extensive farming? Some might argue more intensive farming can be land sparing (or allow for land sharing). More extensive farming will gobble up acres and lead to the opportunity cost of habitat conversion. And I use conversion instead of loss… for agriculture (farming) does not remove habitat from the landscape, it merely changes the balance [ok, ‘merely’ is too soft, but you see my point]. Not sure if Thomas intended this, but I can see one benefit to his line of thinking… as we have lots of experience with honeybee culture, genetics, and monitoring they might serve as a model species in researching the impacts of landscape modification. Maybe this is too far fetched, but if one has very old specimens of bees from which DNA can be isolated there may be information to be gleaned by comparing such to DNA of current populations. Domestication genetics is seen for plants, why not for domesticated pollinators? Are you familiar with any research on microbial commensals and pollinator distribution/success? Much as our own gut microbial communities influence our health I’m guessing pollinator fitness might be similarly affected, no? I meant both intensive and extensive, though in the UK more intensive use of inorganic fertilisers has probably had the biggest impact. Loss of fields that in some years would be fallow, or conversion of species-rich meadows to largely grass monoculture, is loss of habitat, right? “Old” specimens of honey bees are going to be a couple of centuries in age at most and we know that they have been domesticated for many centuries, so not sure how much we’d gain from that. Not heard of any work on microbial commensals but it’s an interesting idea. Have only read the abstract thus far but their results are fascinating. “Habitat loss due to more intensive farming?? Or do you mean more extensive farming? Some might argue more intensive farming can be land sparing (or allow for land sharing). More extensive farming will gobble up acres and lead to the opportunity cost of habitat conversion.” Clem. I’ve heard this argument before from people who also propose that all of us humans should be corralled into cities so that the majority of the land can be turned over to “wilderness” in good Brave New World technocratic style. Extensive farming, I’d argue, is where milliions of diverse peoples work with nature to create their own livelihoods as well as very beautiful and biodiverse habitats and landscapes all over the world. Something we have been doing for many hundreds of years now without causing the ecological crisis that intensive farming is now causing. Far from being the problem, the myriad varieties of extensive farming themselves and their biodiversity are under threat from intensive agribusiness which too often acts as an asset-stripper to land, wildlife and local people alike. Also can’t imagine the wealthy elite who often own almost all the land ever “land-sharing”. More likely to start fomenting evil schemes to extract the maximum rent from it to hide in their trust funds. Well, they attribute the part about “as much as one third of the food we eat is pollinated by bees” to the Environment Secretary, November 2014. For the rest, I expect they did a quick google, came across the usual myths going round the internet, and put the publicity together based on that. They seem to think bees = honey bees. Hmmm, agreed, seems an odd stance for the Xerces to take. Oh dear, mythology spreads like a plague doesn’t it. I’ve lost track of the times I’ve ended up muttering “there are other kinds of bees than domesticated ones you know” as someone blithely twitters on about how “we should all become beekeepers to save ‘the planet’ from starvation”.